Did you know that you can turn your USB into a BBQ? You only need the following ingredients. 1) A bacon flash drive. 2) A chicken flash drive. Next time you’re having a data crisis just wing it with these usby chicken. Or maybe you’d rather like a drumstick? Believe it or not, you can actually put chicken memory sticks in your pocket and not cause any grease stains. Or have it drip down your pants. 3) A corn flash drive! Yep. What would be a barbecue without this? Modified at 1GB this corn on a stick makes for a nice, obligatory side item. Along with bacon and chicken flash drives there can be no more doubt now that you will be successful in sifting through your data maze. Of course you’re allowed to enhance your barbeque stick-out even further…like with hamburger flash drives or french fries memory sticks. So what are you’re waiting for? Fire up that USB grill and chomp at the bit without having to lose patience. Those are some pretty funny looking USB drives, would definitely give a laugh to any of its owners! And to anyone who just comes by. why is it all in american, for gods sake! You could at least show the english prices. i would buy more if the prices were in English!!! I wish you would use your name and leave an email address. Please dont leave comments all over the site, especially in caps. If you have concerns then one civilized comment is more than sufficient. Or contact me via the contact form. I apologize that you dont see the prices in pounds, but this site is predominantly American and its possible that the listings dont geotarget every IP address correctly. Also, please be aware that I dont sell or produce any of these flash drives – I’m just an affiliate. I wonder if your pet will eat this up! 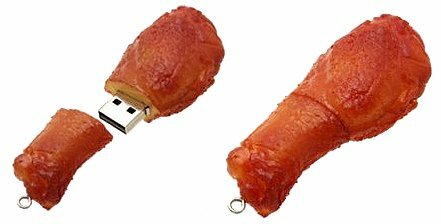 LOL I like the bacon flash drive. It looks so real, just like a real meat that you can eat! It looks more edible than the frozen bacon pack found in the market! I wonder how they were able to manufacture and to create this design. .-= Nathaniel@web design Sydney´s last blog post ..Were hiring! Get the best of both worlds =-. I’m amazed how the manufacturer make this design. I just want to have this in my collection!